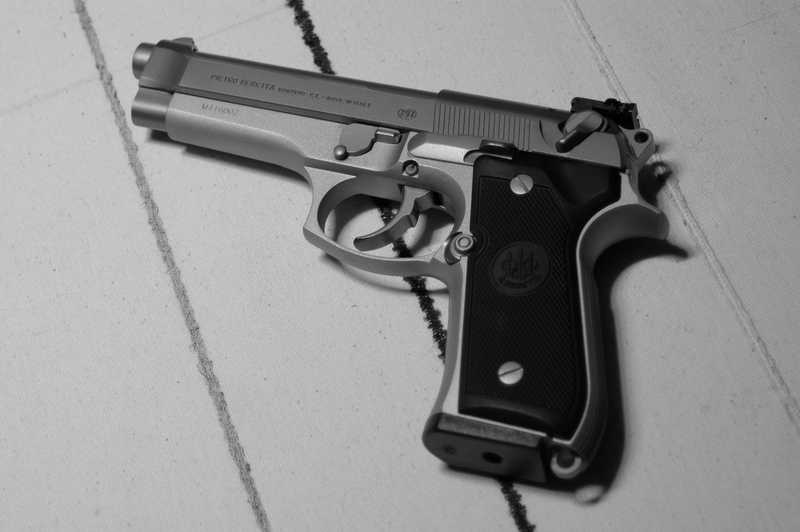 The Beretta 92FS is a fantastic full sized handgun that is most popularly recognized as a tactical weapon. It’s utilized by police force and military, as well as civilian use. However, it happens to be particularly useful as a hunting weapon as well. The short recoil and fast firing cycle makes a great combo for hunting game or protecting yourself and loved ones during hiking and camping trips. You’ll need a proper holster for this handy weapon, so we’ve compiled the best Beretta 92FS holsters on the market. We often stick to either leather or kydex holsters, and this review is no exception. We’ll let you know which was our favorite of the bunch at the end of the review. For a full sized weapon, we think the biggest concern is retention, especially when it comes to outside the waistband holsters. There are plenty of fantastic options available online to meet the requirements. Materials – Our first option from R&R Holsters is made entirely of kydex in a dark gray color. The kydex material is only .08” thick, allowing for a lightweight but highly protective holster to your Beretta 92FS. This option is also available for the 92FS compact model or a 92FS with a rail. This outside the waistband holster has two belt clips, which can be adjust for height and cant from 0-15 degrees. You can tighten the retention of the belt clip screws as well. 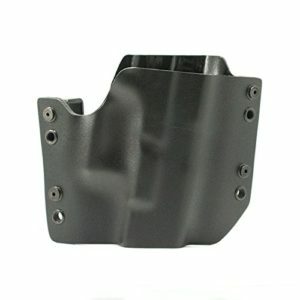 The back of the kydex holster features a partial sweat guard to protect your handgun and keep your body comfortable. R&R Holsters includes a one year replacement warranty with its product. Performance – When you’re dealing with a full sized handgun in an outside the waistband holster, you really want to go for something that provides full coverage. Plus, if you have any accessories or upgrades attached to your Beretta 92FS (perhaps some aftermarket night sights), the additional rail space in this option is great. Especially if we’re focusing on holsters that complement your hunting or hiking activities, the high level of protection this kydex holster offers is great. What we’re not huge fans of are the belt clips simply because they leave a little space for some sliding. If you tighten your belt and the retention screws just right, you should be fine, but you may experience a little shuffle here or there as you wander through nature. What we say – This is the best Beretta 92 holster if you own the FS compact model or the FS with some utilized rail space. 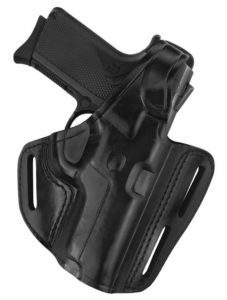 This holster provides one of the best amounts of protective coverage on the exterior side. Materials – Tagua’s leather holster is made of high grade cowhide. 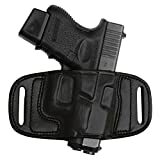 It was designed specifically as an outside the waistband holster for tactical, recreational, and all outdoor activities, including hunting and hiking. Featured are two belt loops, offering a straight up and down cant for your full sized weapon. There is additional stitching for reinforcement around the entire holster, as well as double stitching at the trigger guard and along the rail. The muzzle is left open at the base, and the majority of the grip and rear of the barrel is left exposed as well. Easily grab your Beretta 92FS as soon as you need it. This option does not accommodate the compact model. Performance – For a leather option, Tagua offers a really affordable option. That being said, it does cover very little of your Beretta 92FS. This selection takes a completely different path from the previous choice, but it comes with a list of its own benefits. It will be much easier to grab your weapon without fussing or looking when it’s time to aim. You can position the holster pretty much anywhere on your waist as well, as long as you can grab it in the straight up and down position. It’s convenient for fast action type scenarios, but you may need to be a little careful. With the retention relying solely on your belt, you’ll want to be extra careful when securing it in place. What we say – This is the best Beretta 92FS holster for those who want a low cost leather option and are not concerned with “full coverage.” If you prefer to believe that less is more, look no further than here! 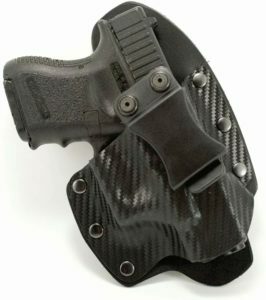 Materials – You may recognize this hybrid holster! Outlaw Holster’s kydex holster is featured in carbon fiber black, and it can be purchased for the Beretta 92, Beretta 92FS compact, or the Beretta 92FS with rail. The kydex holster is bolted in place with six non adjustable screws. The leather back panel acts as a full sweat guard against the body. As an inside the waistband holster, this option includes a single belt clip that is held in place with two adjustable retention screws. Height is not adjustable, but you can arrange the cant to your preference. Outlaw Holsters includes a one year replacement warranty with its product. Performance – We come back to this particular hybrid holster from Outlaw Holsters again and again. This biggest reason is because this company is one of the few that offers a single holster for nearly every type of handgun on the market. Seriously, this covers any Beretta 92/92FS model. 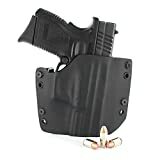 Plus, when we specifically look for kydex holsters, the options can sometimes get a little limited. For hunting purposes, you may not necessarily think to purchase an inside the waistband holster, but this may come in handy for your full sized weapons. Plus, you can use your Beretta as a concealed carry now too! The single belt clip may be a struggle for the Beretta, but some adjustments can remedy that. What we say – This is the best holster for Beretta 92FS handguns no matter if they’re compact or full sized. As the only inside the waistband option within this review, this may be something to consider while scavenging outdoors. Materials – Gould & Goodrich’s outside the waistband holster is made with top grain vegetable tanned genuine leather in all black. It is highly molded to the shape of your gun. This option accommodates the Beretta 92 compact model and the 92FS, as well as several other Beretta model handguns. Featured on the holster are three belt loops, which allow the user to choose between a strongside carry or a forward FBI cant. There is additional stitching for reinforcement straight across the rail and ergonomically around the trigger guard. Best of all, there is a wide thumb break that retains your weapon with a snap closure. Performance – You can certainly see a big difference in quality between this choice and the rest. What makes this holster so appealing for the Beretta 92FS is the thumb break. This is probably the only option that you won’t have to worry for a moment about any rocking back and forth or slipping around on your belt. With adjustable cant included, this can be a comfortable way to wear your weapon at your side throughout the day and while you travel on foot or in car. There may not be rail space available, but it should comfortably fit your full sized 92FS or the compact. What we say – This is the best holster for Beretta 92FS owners that intend to perform in high activity or do a lot of moving around. Even when hunting, simply snap open the thumb break and go. Fits BERETTA 92 Compact, 92 Centurion, 92D, 92D Compact, 92F, 92FC Compact, 92FS, 92 FS Centurion, 92G, 92G Centurion, 96 Centurion, 96, 96D, 96D Centurion, 96DS, 96G, 96FS. Our favorite holster for the Beretta 92FS easily became the Three Slot Pancake Holster from Gould & Goodrich. For one, it’s a very beautiful holster. That’s not really the most important factor by any means, but the quality craftsmanship from this brand has always been admirable. If you couldn’t tell from our description of the holster’s performance, it’s the thumb break that won us over in this review. With a nearly 5 inch barrel, you need a holster that will comfortable maintain the weight of your Beretta as you navigate through wooded areas, hills, or wherever you’re doing your outdoor activities. A quick release from the snap closure, and you can grab the grab as quickly as ever. It may have been the most expensive option within the review, but Gould & Goodrich still offers its outside the waistband pancake holster at a very affordable cost. Just about anybody can pick this up.